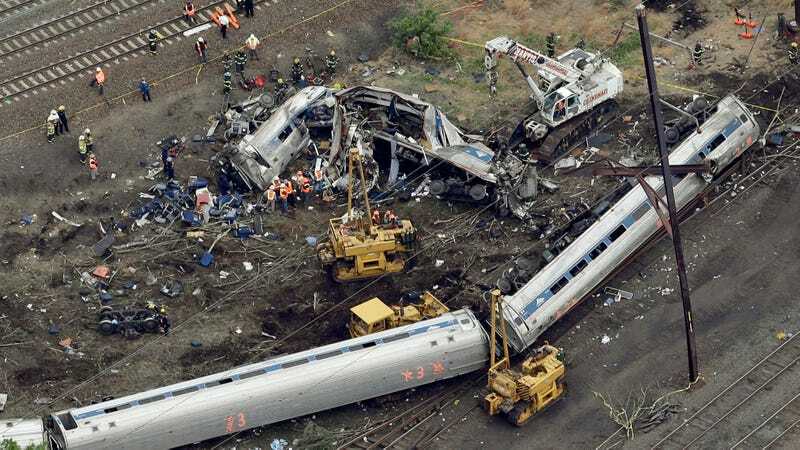 The engineer who was operating the speeding Amtrak train that derailed and killed eight people in Philadelphia in 2015 won’t face criminal charges. Prosecutors at the Philadelphia district attorney’s office today said that they have no proof that the engineer, Brandon Bostian, was under the influence of drugs or alcohol or using a cell phone, reports the Associated Press. There was no evidence that Bostian acted with “conscious disregard” when he accelerated the train to 106 mph on a 50 mph curve. Lawyers Thomas R. Kline and Robert Mongeluzzi, who represent more than 30 victims and their families, described their clients as bitterly disappointed and said many remain in constant pain two years later. Kline believes that Bostian, now 34, should at least face reckless endangerment charges, if not the more serious charges that require a finding of intent. “If he is allowed to escape responsibility, then it is an invitation for every culpable person who operates a vehicle — whether it be a train or a car or a bus or a boat — to say, ‘I forgot where I was,’” Kline said. Last October, Amtrak agreed to a $265 million settlement. In the past, Bostian has been described as a train enthusiast. He declined to comment on AP’s story. On the evening of May 12, 2015, the northbound Amtrak 188 was headed to New York City out of Philadelphia’s 30th Street Station. It took a 50 mph curve at 106 mph and derailed, killing eight and injuring over 200.